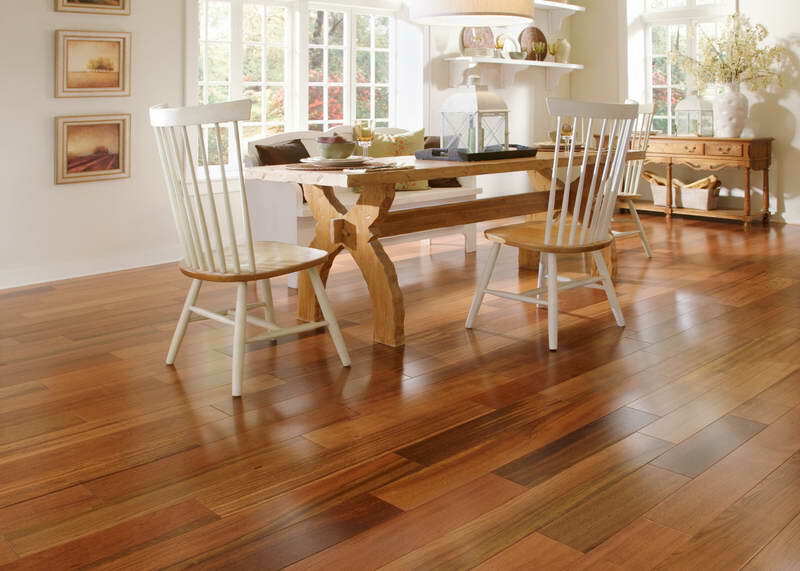 When looking for a type of flooring to put in your home, be sure to consider hardwood flooring as an option. One of the best things about hardwood flooring is that it provides a durable surface to walk on and more than often doesn’t have issues with denting or other kinds of defects. Not only are hardwood floors less prone to damage, but they also last for an extremely long time. The types of hardwood flooring mentioned in this article are all great choices and hopefully, you’ll be able to land on one of them for your next flooring installation. Engineered wood is by far one of the more interesting flooring choices available. Because of the fact that this type of wood is made from several plies, it is one of the more versatile options you have in regards to the hardwood. Typically, engineered wood is thought to work as a first level type flooring, meaning they were designed to be used on a slab in a basement for example. Since then, engineered wood has practical uses in nearly all aspects of a home, including kitchens and dining rooms. Despite its versatility, engineered wood remains one of the cheaper flooring types when specifically looking at hardwood. One of the strong areas of engineered wood is its ability to resist and combat moisture. Often times, wood can feel a bit damp when prolonged to moisture, but engineered wood is built to resist it. When looking at engineered wood compared to other types of hardwood flooring, such as solid wood for example, there isn’t much of a visual difference between the two, but the difference is the durability of engineered wood compared to its competitors. Given how versatile it is, and the fact that it can directly be installed on top of concrete, I highly recommend engineered wood. Solid wood flooring is one of the more popular types of hardwood flooring as it is used in many homes worldwide. There are many advantages to solid wood flooring and one of the biggest is that it’s easy to install and to clean. Typically, hardwood floors aren’t prone to gathering a lot of dust and excess debris, which makes them simpler to clean. Usually, just a mop and even a vacuum is all it takes to keep hardwood floors clean and solid wood is by far one type that requires less maintenance. Solid wood is also known for how it helps increase and improve the acoustics in rooms. Most recording studios and even concert halls will opt for solid wood due to the fact that it can minimize vibrations and hollow sounds. In addition, solid wood is extremely durable and can typically last for long amounts of time, but solid wood floors can get scratched or damaged if not taken care of properly. Still though, solid wood remains to be one of the more consistent types of hardwood flooring used, so it’s no wonder that it’s so popular. Unfinished wood flooring, despite what the name suggests, is actually fine to use. By unfinished, this means that the wood is typically not stained and ‘finished’, meaning it doesn’t exactly have the gloss or sheen that finished wood does. Regardless, unfinished wood has a lot of upsides as it directly comes from the mill and can be installed with no issue. Once the unfinished wood is ready, it’s typically sanded which gives it more of a uniform look and feel, making installation easy. In fact, unfinished wood is able to seal the tight gaps and empty spaces that can potentially be left behind when installing flooring. Since unfinished wood is straight from the mill, it has more of a natural look and can be easily customized. For example, if you wanted to apply a certain finish to the wood, you would be able to do that without worry about damaging the wood. The one issue that can arise with unfinished wood however is that it can take longer to install since it isn’t as cleaned up as finished wood, but if you have time to spare, this may not be much of an issue at all. Finished wood is exactly the opposite of unfinished in that the wood comes already treated and ready to install without having to worry about processes like sanding. With the wood treated, this makes finished wood less likely to have problems with stains, discoloration, and any other sort of surface defect. Since finished wood is usually ready to be installed from the manufacturer, this makes the installation process much quicker than with other types of hardwood flooring. Finished wood flooring is known for being ready the day it’s installed so there’s no hassle in wondering whether or not you can walk on it soon after installation. The installation process of finished wood is rather simple and most often than not, finished wood will come with some sort of manufacturer’s warranty against damages. Even though the wood may have a nice finish, it can still be sanded and even refinished overtime. Usually, re-sanding finished wood isn’t necessary, and since it does come pre-sanded, this can save you money in the long run since the wood will be good to go once installed. Finished wood can be a little more expensive when installed, but the maintenance afterward is usually very minimal on an economic scale. Hopefully, this article was able to give you some pointers on the different types of hardwood flooring you can install in your home. While there are several different kinds, each one has its own advantages against damaging elements along with different ways to install the flooring. The majority of these hardwood floors will last you for an extremely long time, so if you plan on living in your current home for a long time, a particular style of hardwood flooring might be worth looking into. Overall, I’d recommend any of the hardwood listed in this article because with these four, there really is no wrong choice as it just boils down to personal preference. My Name is Sammy Dolan and I run the blog at Home Clean Expert. I am currently in the process of juggling home renovation, working and coming up with new ways of making life exciting for my family.